Arrow Video invites you to partake of H.G. Lewis' BLOOD FEAST on October 24th! ON OCTOBER 24TH, ARROW VIDEO SERVES UP A 2-DISC SPECIAL EDITION OF H.G. LEWIS' INFAMOUS "BLOOD FEAST!" Though I have seen BLOOD FEAST in 35mm, and briefly met and shook hands with the late H.G. Lewis, I have to admit that I'm not a huge fan of this film. 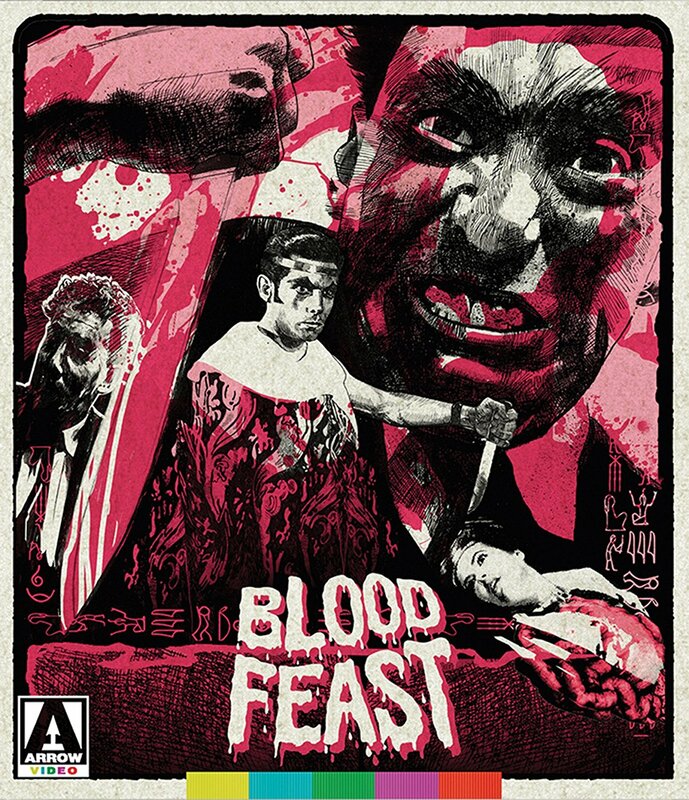 That being said, I cannot deny that BLOOD FEAST served as a very important part of Horror film history, as it is the great grandaddy of splatter cinema! Arrow's release boasts an HD transfer of the film, plus a wealth of extra features. This is such a great-looking release, that even I wouldn't mind adding it to my collection! Synopsis: The filmography of late movie maverick Herschell Gordon Lewis brims with the mad, macabre, and just downright bizarre. But perhaps the most unhinged of all his directorial efforts, and certainly the most influential, must surely be his original gore-fest BLOOD FEAST, the first ever splatter movie! Dorothy Fremont is looking to throw a party unlike any other, and she gets just that when she hires the decidedly sinister Fuad Ramses to cater the event. Promising to provide her guests with an authentic Egyptian feast, Ramses promptly sets about acquiring the necessary ingredients the body parts of nubile young women! 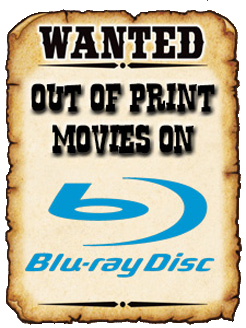 High Definition Blu-ray (1080p) and Standard DVD presentations. Scum of the Earth – Herschelll Gordon Lewis’ 1963 feature! Blood Perspectives – Filmmakers Nicholas McCarthy and Rodney Ascher on Blood Feast! Herschell’s History – Archival interview in which director Herschell Gordon Lewis discusses his entry into the film industry. How Herschell Found his Niche – A new interview with Lewis discussing his early work. Archival interview with Lewis and David F. Friedman. Carving Magic – Vintage short film from 1959 featuring Blood Feast Actor Bill Kerwin! Alternate “clean” scenes from Scum of the Earth! Promo gallery featuring trailers and more! Feature length commentary featuring Lewis and David F. Friedman, moderated by Mike Grady. Reversible sleeve featuring original and newly-commissioned artwork by Twins of Evil! Yowza! They really went all out for this release! 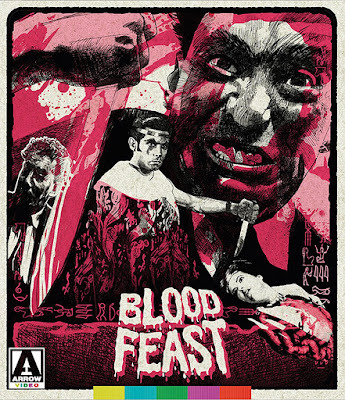 Arrow Video's 2-Disc Special Edition of BLOOD FEAST will be available on Tuesday, October 24th! Order your copy today from AMAZON, BULLMOOSE, or DIABOLIK DVD! 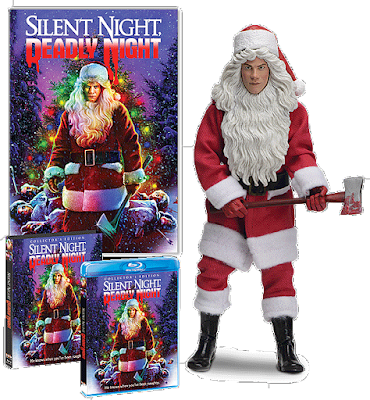 Scream Factory "Punishes" Horror fans this December with SILENT NIGHT, DEADLY NIGHT: COLLECTOR'S EDITION! ON DECEMBER 5TH, SCREAM FACTORY GRANTS EVERY HORROR FAN'S CHRISTMAS WISH WITH THEIR AMAZING COLLECTOR'S EDITION OF "SILENT NIGHT, DEADLY NIGHT!" SILENT NIGHT, DEADLY NIGHT is a mean-spirited little slasher flick that many of us have grown to love over the years. 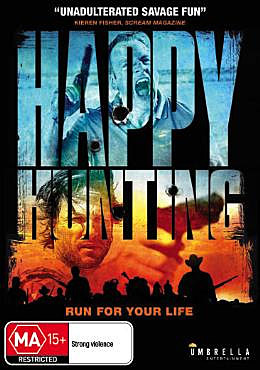 Initially pulled from theaters due to protests from angry parents, the film found an audience on home video, and built up a healthy cult following! 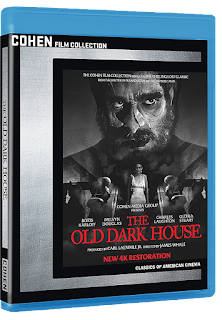 And though it has been released on DVD (and Blu-ray) by Anchor Bay in the past, this new release from Scream Factory looks to be the last copy of this film that any of us will ever have to buy! Oh man, I hope this is under my tree this Christmas! That would be KILLER! Synopsis: Community leaders tried to stop the release. The P.T.A. fought to ban it. Now one of the most controversial slasher films of all time is back in a new high-definition release! 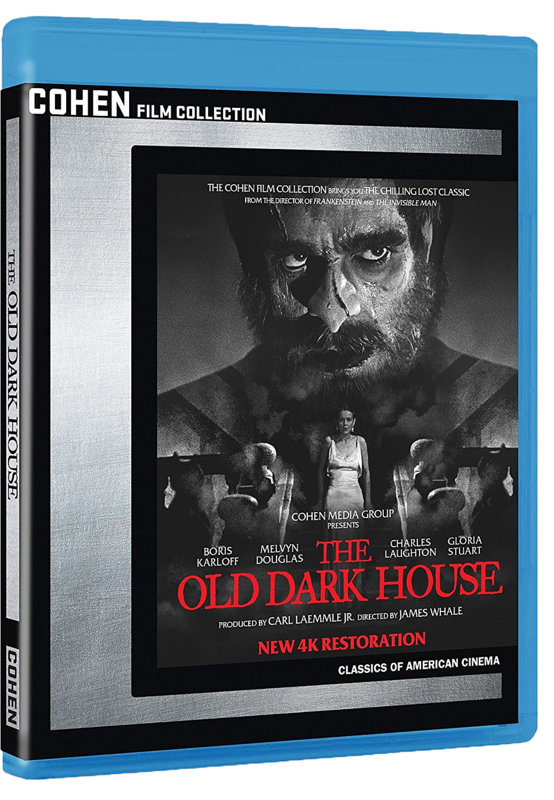 This new edition of the horror holiday favorite has been restored from the original vaulted film negative. NEW! 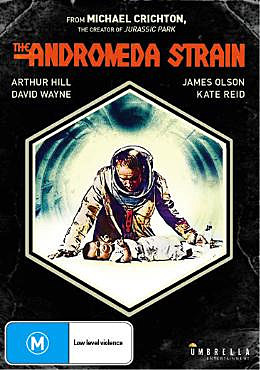 Original Theatrical And Unrated Versions Of The Film Taken From and all-new 4K Scan Of The Original Camera Negative! NEW! Slay Bells Ring: The Story Of Silent Night, Deadly Night – Featuring Interviews With Writer Michael Hickey, Co-Executive Producers Scott J. Schneid And Dennis Whitehead, Editor/Second Unit Director Michael Spence, Composer Perry Botkin, And Actor Robert Brian Wilson! NEW! Oh Deer! – An Interview With Linnea Quigley! NEW! 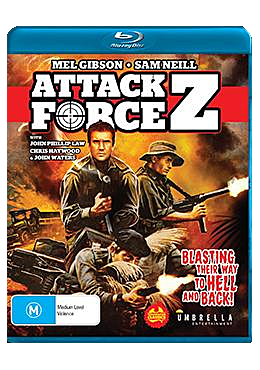 Audio Commentary With Actor Robert Brian Wilson And Co-Executive Producer Scott J. Schneid! Audio Commentary By Michael Hickey, Perry Boykin, Scott J. Schneid, and Michael Spence. New cover art! Lots of new extras! An all new HD transfer of both cuts of the film! Could you ask for anything more? Well.... YES! Also coming out on December 5th (while supplies last), Scream Factory is also releasing a LIMITED EDITION release of this cult classic! (Only 2,000 copies available!) Not only will it come with an exclusive 18x24 rolled poster featuring Joel Robinson's new cover art, but it will also have a limited edition 8-inch Billy action figure from NECA! And holy cow, does this figure capture the likeness of Robert Brian Wilson perfectly! Take a look for yourself below! Billy is here to PUNISH.... YOUR BANK ACCOUNT! Once again, both editions of Scream Factory's SILENT NIGHT, DEADLY NIGHT are available on Tuesday, December 5th! You can order the standard Collector's Edition now at AMAZON, BULLMOOSE, DIABOLIK DVD, or from SHOUT! FACTORY (which will net you a poster and early delivery of your 2-disc Blu-ray). However, the Limited Edition is only available directly from SHOUT! FACTORY's website! On the plus side though, shipping is FREE and you will receive your items a full week early! Either way, get this release pre-ordered gang because it is going to be incredible! STOCK YOUR VAULT: New DVDs & Blu-rays for 10/10/2017! Greetings Vault Dwellers, and welcome to Week #2 of October! Halloween is a mere twenty days away, so most of us should be in the holiday spirit by now! Naturally, watching Horror films is a huge part of celebrating this most sacred of seasons, and luckily there's plenty of new titles to check out this week! Scream Factory has just released THE POUGHKEEPSIE TAPES to Blu-ray, which is kind of amazing as this movie has languished in distribution Hell for a decade! 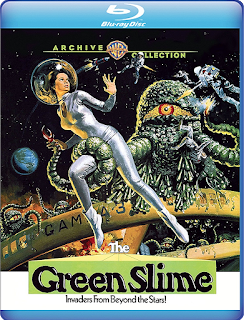 Warner Archive Collection delivers a gorgeous Blu-ray release for THE GREEN SLIME, Criterion Collection added THE LURE to its exceptional catalog of films, and Kino Lorber bulks up their "Mario Bava Collection," with a Spaghetti Western (ROY COLT & WINCHESTER JACK) and Bava's KILL BABY... KILL! 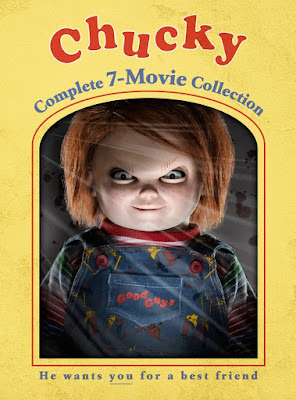 A several former Best Buy exclusives are now widely available (mainly Comedies like PROBLEM CHILD, BOWFINGER, and BASEKETBALL), as are a bunch of cheap Horror movie boxed sets! And for those looking for more contemporary Horror fare, check out WISH UPON and OPEN WATER 3: CAGE DIVE! While not a strong weak overall, there are plenty of titles you may want to snap up! Scroll down to see the full list of this week's new releases! Contains: Death Race, Death Race 2, and Death Race 3: Inferno. Contains: Highlander, Highlander 2: The Quickening, Highlander: The Final Dimension, Highlander: Endgame, and Highlander: The Source. Contains: Hellbilly, Hellinger, Carnage, and Holy Terror. Contains: The Mummy, The Mummy Returns, and The Mummy: Tomb of the Dragon Emperor. Contains: The Scorpion King, The Scorpion King 2: Rise of a Warrior, The Scorpion King 3: Battle for Redemption, and The Scorpion King 4: Quest For Power. This Halloween, upgrade your copies of DAWN OF THE DEAD (2004) and LAND OF THE DEAD! SCREAM FACTORY GOES ALL OUT WITH THEIR UPCOMING COLLECTOR'S EDITIONS OF "DAWN OF THE DEAD" AND LAND OF THE DEAD! I've always been a big fan of George A. Romero's LIVING DEAD films, so I'm pretty excited for these two releases! DAWN OF THE DEAD was an unexpected hit, and far better than anyone expected. (I give most of that credit to James Gunn!) LAND OF THE DEAD, while a far cry from the entries that came before it, is still a fun and engaging zombie flick with Romero's brand of societal commentary. I look forward to double-dipping on these two titles! 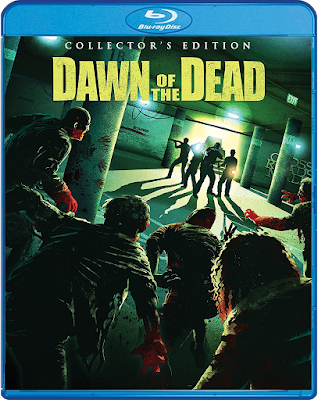 Synopsis: Heart-pounding action and bone-chilling thrills power this edgy and frightening remake of George A. Romero's apocalyptic horror classic, DAWN OF THE DEAD! From visionary filmmaker Zack Snyder (300, WATCHMEN), this pulse-pounding jolt-a-thon stars Ving Rhames (GUARDIANS OF THE GALAXY, VOL. 2), Sarah Polley (SPLICE), Jake Weber (WENDIGO), Mekhi Phifer (DIVERGENT), and Ty Burrell (Modern Family). The world is in danger when a mysterious virus turns people into mindless, flesh-eating zombies. In a mall in the heartland, a handful of survivors wage a desperate, last-stand battle to stay alive and maintain their humanity! NEW! HD Master Derived From The Digital Intermediate Archival Negative! NEW! Take A Chance On Me – An Interview With Actor Ty Burrell! NEW! Gunn For Hire – An Interview With Writer James Gunn! NEW! Punk, Rock, & Zombie – An Interview With Actor Jake Weber! Deleted Scenes With Optional Commentary By Director Zach Snyder And Producer Eric Newman. NEW! HD Master Derived From The Digital Intermediate Archival Negative With HD Inserts! Audio Commentary With Director Zach Snyder And Producer Eric Newman. Synopsis: Legendary filmmaker George A. Romero returns to unleash another chapter in his zombie series! In this new tale of terror, Romero creates a harrowing vision of a modern-day world where the walking dead roam a vast uninhabited wasteland and the living try to lead "normal" lives behind the high walls of a fortified city. A new society has been built by a hand of ruthless opportunists, who live in luxury in the towers of a skyscraper, high above the less fortunate citizens who must eke out a hard life on the streets below. With the survival of the city at stake, a group of mercenaries is called into action to protect the living from the evolving army of the dead waiting outside the city walls. LAND OF THE DEAD features a cast of great actors including Dennis Hopper (TEXAS CHAINSAW MASSACRE PART 2), Simon Baker, Asia Argento, Robert Joy and John Leguizamo. NEW! Cholo’s Reckoning - An Interview With Actor John Leguizamo! NEW! Charlie’s Story – An Interview With Actor Robert Joy! NEW! The Pillsbury Factor – An Interview With Actor Pedro Miguel Arce! NEW! Four Of The Apocalypse – An Interview With Actors Eugene Clark, Jennifer Baxter, Boyd Banks, And Jasmin Geljo! Dream Of The Dead: The Director’s Cut With Optional Commentary By Director Roy Frumkes! NEW! 2K Scan Of The Interpositive With HD Inserts! NEW! Audio Commentary With Zombie Performers Matt Blazi, Glena Chao, Michael Felsher, And Rob Mayr! Audio Commentary With Writer/Director George A. Romero, Producer Peter Grunwald, And Editor Michael Doherty! A Day With The Living Dead Hosted By John Leguizamo. 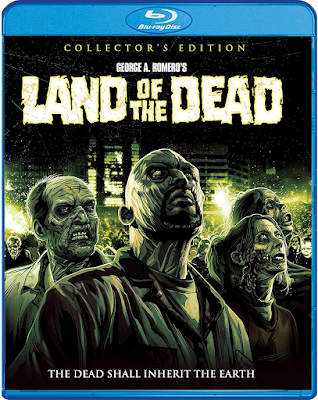 Scream Factory's stacked 2-disc Collector's Edition of LAND OF THE DEAD hits stores on October 31st! Order it now from AMAZON, BULLMOOSE, DIABOLIK DVD, or SHOUT! FACTORY. As is the case with DAWN, if you order from Shout! you'll receive your disc TWO WEEKS EARLY with a Free poster! AFTER MIDNIGHT, go to A QUIET PLACE IN THE COUNTRY to enjoy THE DEVIL'S CANDY! 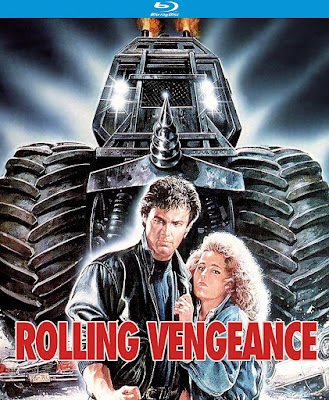 Once again, Scream Factory manages to find more genre films that I've never seen before! A Horror anthology no one expected to get a Blu-ray release, a Franco Nero tale of terror, and a heavy-metal filled IFC Midnight title are all now part of Scream Factory's insanely huge catalog of fright flicks! Are you as excited as I am? If so, scroll down to learn more about these three new releases! Synopsis: "Welcome to Fear 101. There will be a test." Higher education is about to dive into the depths of hell with this trilogy of terror that will scare you senseless. Marg Helgenberger (Species) stars in this psychological thriller that's guaranteed to get inside your head ... and stay there! NEW! Audio Commentary With Writers/Producers/Directors Ken and Jim Wheat! NEW! Interview With Actress Jillian McWhirter! You can purchase AFTER MIDNIGHT now at AMAZON, BULLMOOSE, DIABOLIK DVD, or directly from SHOUT! FACTORY. Synopsis: "Metal rules … but Hell is eternal." A family faces off with evil itself in a house from hell in this hard-rocking shocker from Sean Byrne, the director of THE LOVES ONES. 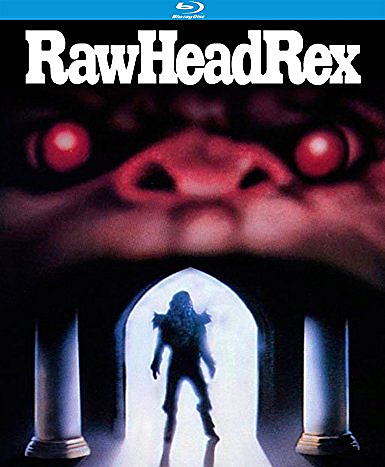 Diehard metal-head and struggling artist Jesse (Ethan Embry, CHEAP THRILLS) moves with his wife (Shiri Appleby, UNREAL) and daughter (Kiara Glasco) to a rural Texas town, unaware that the house they got for an unbelievable deal comes with a grisly history. Their dream home turns into a nightmare as disturbing demonic occurrences culminate with the appearance of Ray (Pruitt Taylor Vince, Identity), the home’s former resident – who’s destined to do the devil’s bidding. 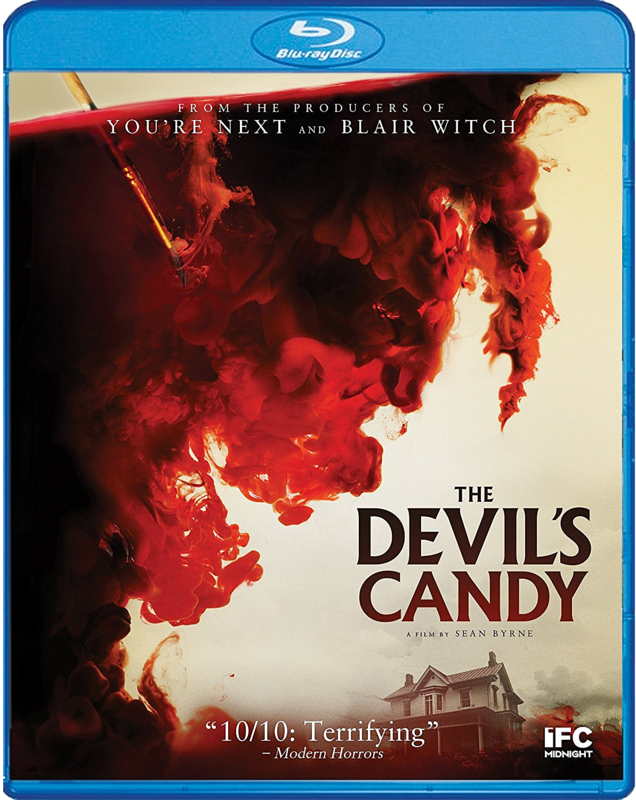 Featuring the music of Metallica, Slayer, Pantera, and Sunn O))), THE DEVIL'S CANDY is “the complete midnight movie package … characters to root for, narrative, and a spot-on mix of scares [to] mess with your head” (Collider)! 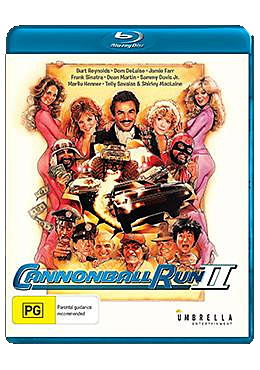 Audio commentary by director Sean Byrne. THE DEVIL'S CANDY is now available on Blu-ray at AMAZON, BULLMOOSE, and SHOUT! FACTORY. Order it today! Synopsis: A prominent painter Leonardo (Franco Nero, JOHN WICK: CHAPTER 2, DJANGO) is plagued by nightmares that include himself and his lover/press agent Flavia (Vanessa Redgrave, THE DEVILS). His agent is convinced that he just needs some rest. So, he rents a villa in the countryside. Between creating a new painting and trying to fix up the dilapidated cottage, Leonardo's nightmares continue but … they are now getting worse. Will the nightmares continue and take the artist into a downward spiral into madness? NEW! Interview With Actor Franco Nero! A QUIET PLACE IN THE COUNTRY is now available to own on Blu-ray. Order your copy now from AMAZON, BULLMOOSE, DIABOLIK DVD, or straight from SHOUT! FACTORY.